Check under the cut for a step-by-step tutorial! 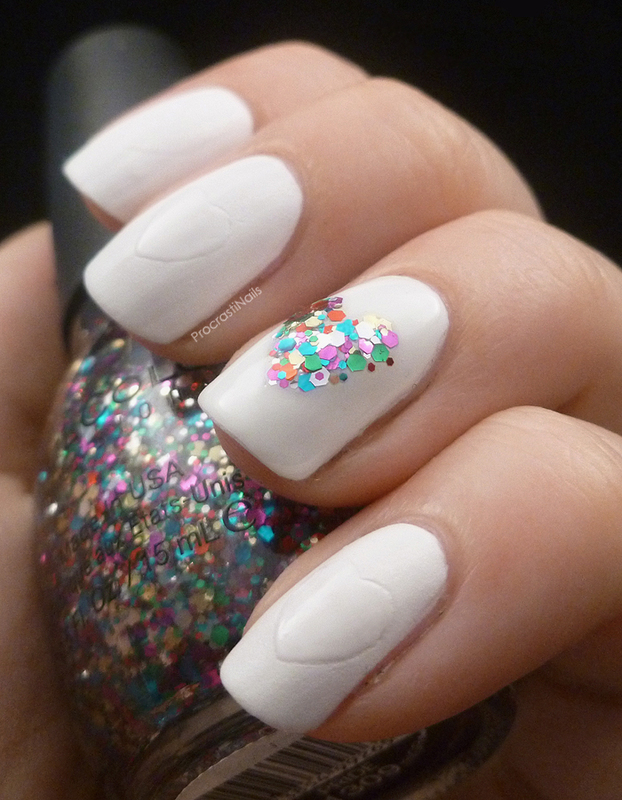 Glitter Nail Polish of your choice - I used Sinful Colors Pride. A Sponge - this is to soak up the clear polish and leave you with just the glitter, you can use any kind of sponge but I find a white makeup sponge the best because you can see the glitter easily to pick it up and there's no holes for the glitter to get stuck/lost in. And you're good to go! Ready? Let's start! 1) Paint your base polish on your nails and let it dry. I used Julep Hope which is a white matte polish. Then take your glitter polish and brush some of it on the sponge. 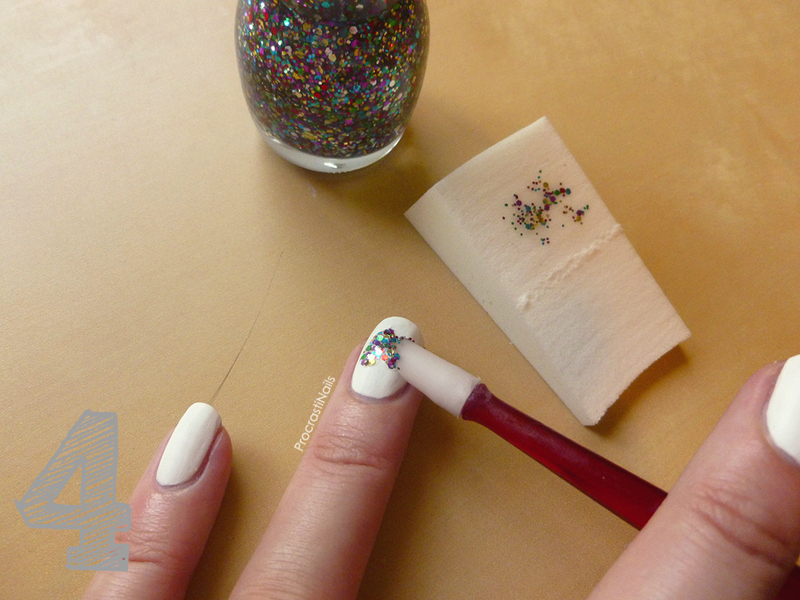 2) Take your plastic cuticle pusher and dab it on top of the glitter to pick up as much or as little as you want. Start small because remember you can always come back and get more, but it's difficult to get glitter off once it's on the nail! 3) Note where on the cuticle pusher your glitter is stuck - you're going to want to be aware of that when you apply it to the nail. 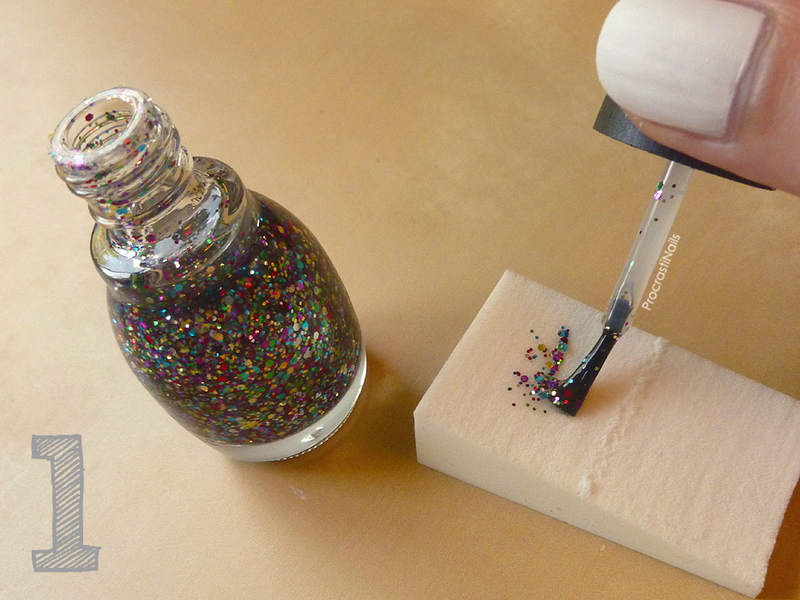 This is also a good way to see which sizes/colours of glitter you're working with. 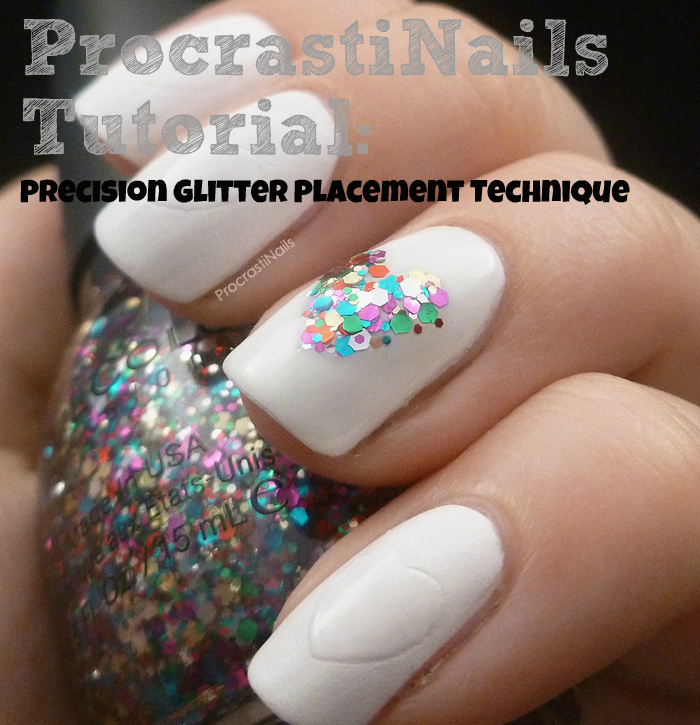 If you want to remove any certain glitters you could use a toothpick or your nail to pull them off at this point. But make sure you work fairly fast because we don't want the polish to dry to the cuticle pusher! 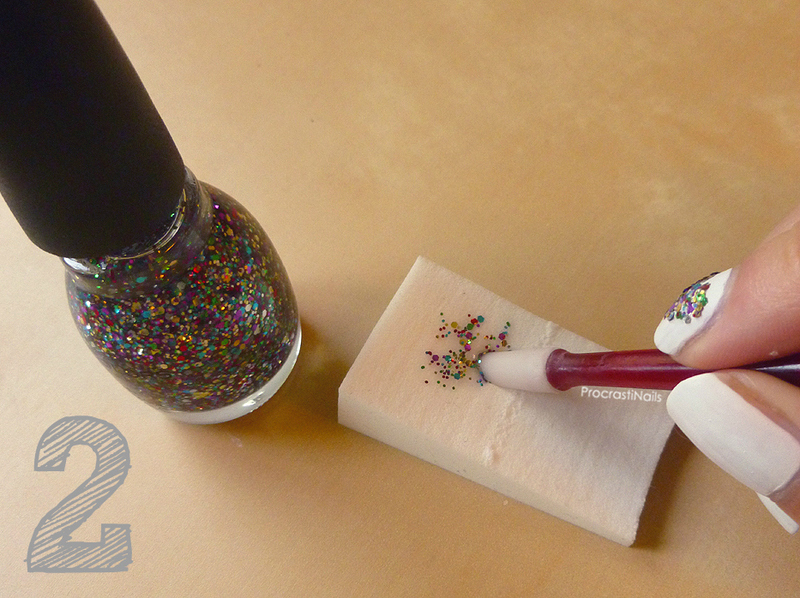 4) Press the plastic cuticle pusher with glitter onto your nail in the places you want the glitter to go. I decided to make a heart shape as an accent nail. 5) Using glitter in this way is kind of like doing freehand nail art - start with your basic shape and then go in slowly to fill it in and shape it out. For the heart I started out with two large patches of glitter for the bumps and then repeated steps 1-4 with less glitter on my cuticle pusher to fill it out and make the point at the bottom. 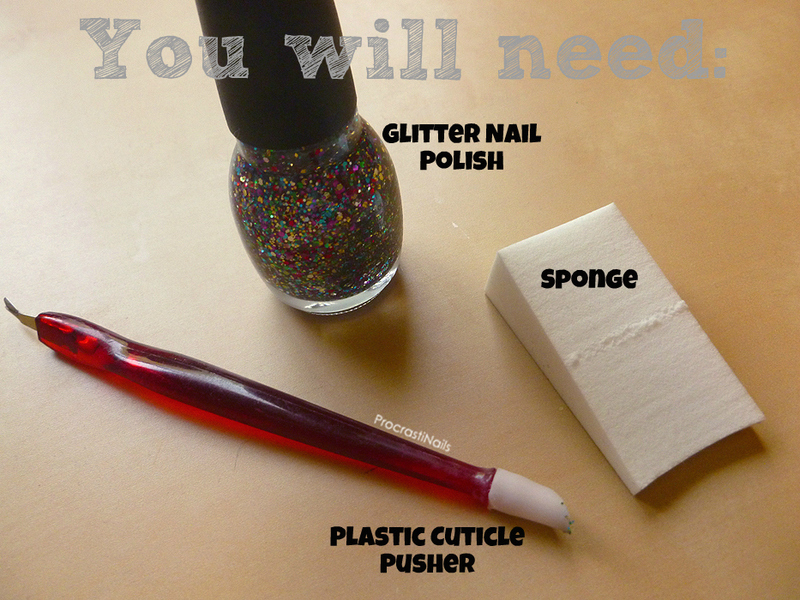 You can add more glitter to your sponge and transfer the glitter as many times as you need. 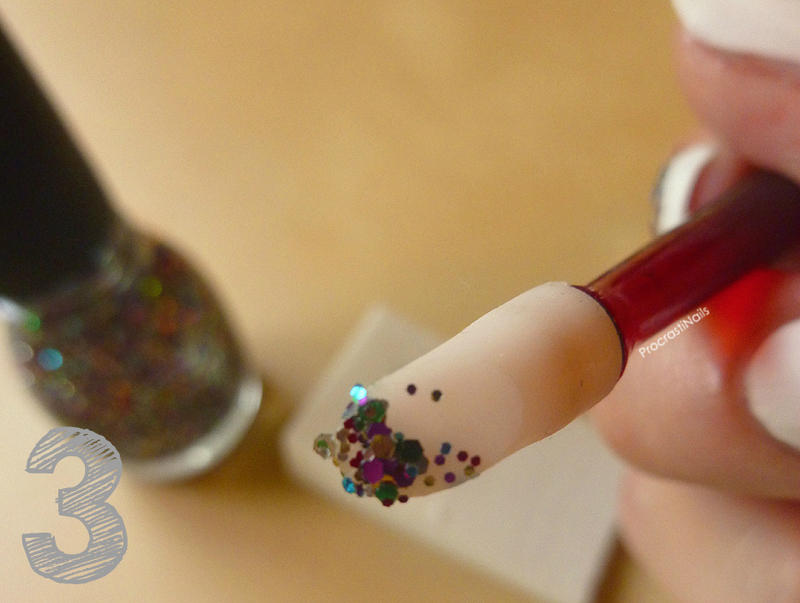 Note that as you go on some glitter will start to dry on the cuticle pusher so you might need some nail polish remover to try cleaning it off periodically. You can also wipe excess (not dried) glitter back onto the sponge if you need. 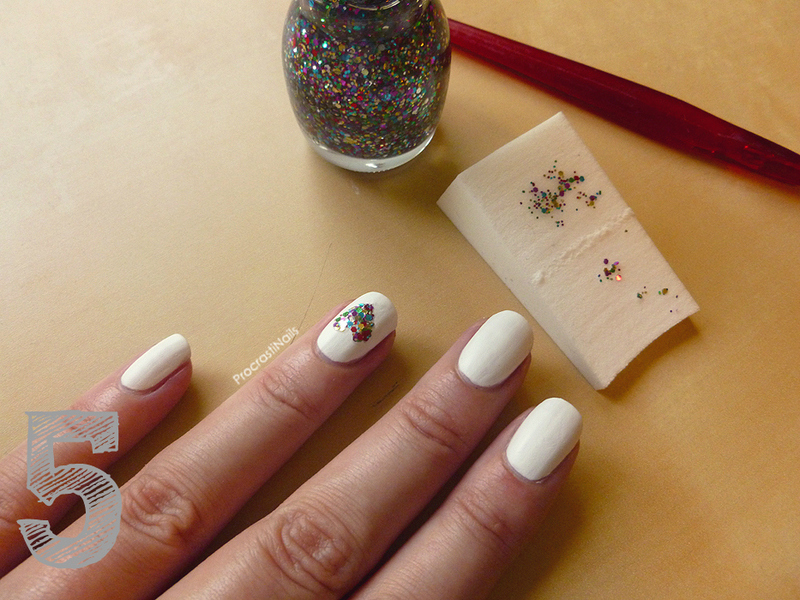 I think this is a super simple look to add to your nail art skills toolkit that results in awesome payoff. Chances are if you paint your nails occasionally you have all these things in your house already, but even if you don't I'd say in total it would cost maybe $5 to go out and buy all of it at a Dollar Store (the cuticle pusher, a cheap glitter polish and a bag of makeup sponges). Let me know if you've tried this technique before, or if you're thinking of giving it a try in the future! This is a great technique but the even more important thing I've learned here is that I need that glitter! Great tutorial on how to do them! This is such a great tutorial! Thanks Katherine!! This is an awesome tutorial! I love this technique! Genius! Great tutorial explaining all the steps. Great tutorial! I love the finished look. This is a fantastic tutorial, I'll be trying it out at some point for sure! Thank you! I'd love to see what you can do with it! I never would have thought to do it like that, and I love the effect! I will have to try it out sometime. Great job! Thank you so much, it's great to hear when you can connect people with a technique they weren't aware of before! :) I hope you give it a try! Excellent tutorial and super cute mani! Agreed, I'm really happy with it! I have never seen this technique! I love it and will have to try it! That's awesome, I can't wait to see what you do with it! This is such a great idea! I love the nail art that you did! Good trick! I was going to do some glitter placement today but lost patience and did something else instead, haha. great tutorial!!! I've never tried glitter placement like this before!